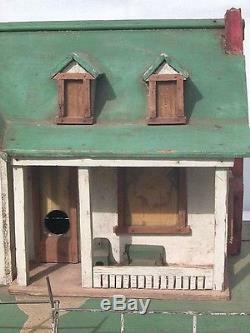 Very detailed OLD model house BIRDHOUSE. 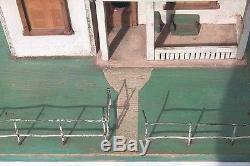 This is a very detailed model house with accurately carved construction details, a heavy wire fence, and yard. It is also a birdhouse. It includes a carved chair and sofa on the porch. All the downstairs windows have what seems to be pictures of windows taken from magazines. These are mounted behind thin clear plastic. The fence likely was cut from a larger piece of wire mesh. The gate swings open and closed. The base (yard) is pine and the rest is a combination of pine and crate wood. The overall condition is very good - especially for the age, likely about the 1940's, and the outdoor use. However there is some slight loss to the top of the chimney and a bit of the back right roof corner was split off years ago. 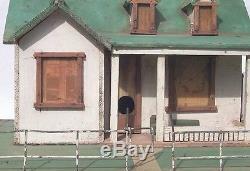 The entire house, yard, and fence has been painted, with no sign of repaint or overpaint. There is some natural aging, crazing, and wear in the paint. The yard is 14 3/4" by 19 1/2"; the house 13 1/2" by 11" and 9 1/2 high to the ridge. 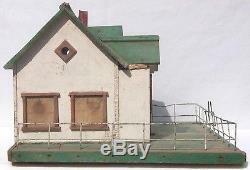 Page down for detailed photos of this model house BIRDHOUSE. A little taste of what we offer. 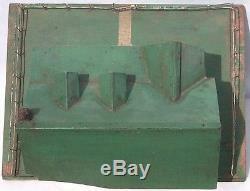 See 100's of other Folk Art items. Samples of SOME of the Birdhouse and Garden items we have available. Metal found object farm chair and stool. 4 Goose yard ornaments from Maine. Yard art robots: One is a birdhouse. See ALL the Birdhouse and Garden items we have available. Closeup from above, gate open... All items guaranteed as described and pictured or return accepted. Bookmark this page for an easy return. See More Pieces Like This. We have Folk Art, outsider art, and unusual antiques, including Tramp Art, Carvings, Quilts, Paintings, Outsider Art, Circus and Carnival items, Religious Art, Furniture, Whimseys, and MUCH more. This is at our choice. These methods are described in detail in our confirmation emails. Most times this can be done by another or using a note on door or signing door tag. This is usually only one to three dollars depending upon what is used. Feedback: We will post feedback to you only after you post your feedback to us. Please provide feedback as soon as possible. What we offer: We have Folk Art, outsider art, and unusual antiques, including Tramp Art, Carvings, Quilts, Paintings, Outsider Art, Circus and Carnival items, Religious Art, Furniture, Whimseys, Architectural Antiques, Birdhouses and Garden Items, Boxes, Canes and Walking Sticks, Industrial Art, Iron & Metal Items, Memory, Bottlecap, Popsicle/Match Stick, Models and Miniatures, Pottery, Primitives, Sculpture, Signs, Banners, and Cutouts, Stands, Planters, Pedestals, Display Pieces, Whirligigs, Weather Vanes, Windmill Weights, and MUCH more. PLEASE REFER TO OUR DESCRIPTION. This takes precedence over anything else. Thank you for visiting and your interest in what we offer. 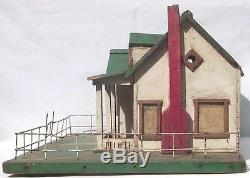 The item "A Very detailed OLD model house BIRDHOUSE. Great Piece" is in sale since Tuesday, February 23, 2010. This item is in the category "Art\Folk Art & Indigenous Art". The seller is "artisans" and is located in US . This item can be shipped to United States, Canada, United Kingdom, Denmark, Romania, Slovakia, Bulgaria, Czech republic, Finland, Hungary, Latvia, Lithuania, Malta, Estonia, Australia, Greece, Portugal, Cyprus, Slovenia, Japan, Sweden, South Korea, Indonesia, Taiwan, South africa, Belgium, France, Hong Kong, Ireland, Netherlands, Poland, Spain, Italy, Germany, Austria, Russian federation, Israel, Mexico, New Zealand, Singapore, Norway, Saudi arabia, United arab emirates, Qatar, Kuwait, Bahrain, Croatia, Malaysia, Chile, Colombia, Costa rica, Trinidad and tobago, Guatemala, Honduras, Jamaica, Panama, Thailand, Ukraine, Barbados, Bangladesh, Bermuda, Brunei darussalam, Bolivia, Ecuador, Egypt, French guiana, Guernsey, Gibraltar, Guadeloupe, Iceland, Jersey, Jordan, Cambodia, Cayman islands, Liechtenstein, Sri lanka, Luxembourg, Monaco, Macao, Martinique, Maldives, Nicaragua, Oman, Peru, Pakistan, Paraguay, Reunion.